Our joints are subjected to wear and tear every single day. As age increases, the lining of joints and the cushioning cartilages degenerate gradually. FidellaTM Joint Fix is a comprehensive joint-care formula which highly recommended for people who experience backache, knee pain, joint stiffness or bone and joint degenerated problems. The formula of FidellaTM Joint Fix is enhanced with anti-inflammation properties, which helps to relief joint pains, repairs and builds cartilage. The goal of FidellaTM Joint Fix is to restore mobility, support cartilage and keep joint movement strong and smooth. · Reduce and prevent inflammation. · Reduce joint pain and muscle aches. · High in natural antioxidant. · Support, repair and rebuild cartilage tissues. · Alleviate joint discomforts and keep joint movement strong and smooth. Mix 1 sachet with 150-200ml of warm / cold water and consume it daily. Air pollution, chemicals in food and poor eating habits increased the risk of getting heart disease. In Malaysia, heart disease has been the number one killer for the past three decades. This statistic goes across the globe, making heart disease the most common cause of death worldwide. 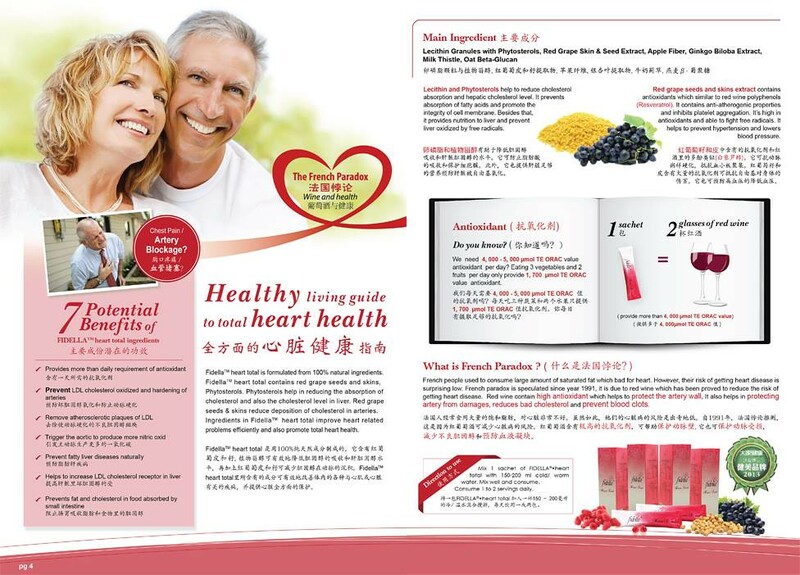 FidellaTM Heart Total is formulated from 100% natural and organic ingredients. It does not contain any side effect or alcohol. FidellaTM Heart Total contains Phytosterols, which helps in reducing the absorption of cholesterol and also the cholesterol level in liver. The benefits of Phytosterols and Resveratrol made FidellaTM Heart Total a very good yet natural treatment for person with high cholesterol. Furthermore, milk thistle reduces the absorption of cholesterol and minimizes the storing of cholesterol in liver. Consume FidellaTM Heart Total improves heart related problems efficiently. · Reduce precipitation of cholesterol in arteries. · High in antioxidant, eliminate free radicals and anti-aging function. arteries from high blood pressure. · Improve blood circulation and boost nutrient absorption in the body. Mix 1 sachet with 150 - 200ml of cold/warm water and consume it daily. The health of every single cell is very important because every single health issue affects our cellular health. FidellaTM Green Mix is a wholesome source of chlorophyll drink that suitable for all age groups. It provides a strong foundation to support good health and keeps our body cells stronger. Chlorophyll maintains healthy cells throughout the body by promoting cell restoration. FidellaTM Green Mix enriched with essential nutrients and it is excellent source of antioxidant which helps to fight free radicals in our body, boost body metabolism rate, anti-cancer and anti-ageing. It is an amazing natural nourishing way that gives energy to your whole family. The unique combination of ingredients in FidellaTM Green Mix has made our product stands out from any ordinary Chlorophyll supplement. · Boost the body immune system. · Neutralize the acidic body by balance the body pH. Mix 1 sachet with 1-1.5 Liter of warm/cold water in a jug, stir well and consume daily. FidellaTM Tone works together with FidellaTM Svelte . Figura to achieve the best slimming results. It reduces the fat absorption by reduces the body’s ability to absorb fat and cholesterol from the gastrointestinal and blood circulation. Besides that, oat fiber in FidellaTM Tone creates satiety feeling which reduces excessive fat intake from snacking. The probiotics in FidellaTM Tone maintains a balance environment in digestive tract which facilitates fat residues and toxins discharged out from the body. FidellaTM Tone works as a detox agent alone. It discharges toxins out from the body and regulates the bowel transit time. Furthermore, it’s a very good solution for people with constipation problems. FidellaTM Tone is able to fulfill your daily requirement of fiber and facilitates your bowel movement. It also cleanses colon and prevents toxin accumulated in the body. · Reduce weight by removing the excess fat residue from the body. · Cleanse and detoxifies the body. · Relieve constipation and regulate the bowel transit time. · Aid digestion and prevent stomach discomfort. · Provide a healthy environment in intestine. · Rich in vitamin C.
Every women wish to stay pretty and look good in every stage of life. However, the signs of aging showed the true age of woman. This is due to the estrogens level in our body decreases gradually after the age of 20. FidellaTM Glow works effectively in women by replacing estrogen loss in the body by enable our body to produce more estrogen. Maintaining a healthy hormone balance reduces the hormone imbalance problems and also eases the menopausal symptoms. The combination of different ingredients in FidellaTM Glow provides breast firming effect and also restores the elasticity and moisture of skins. With the support of FidellaTM Glow, your age doesn’t matter anymore! IT WORKS MAGICALLY IN JUST 7 DAYS! · Improve the hormone imbalance syndromes. · Reduce the menstrual pain. · Enhance firmness of the breast. · Reduce the risk of osteoporosis. · Provide smooth and radiant skin. · Moisture the skin and improve the elasticity of the skin. · Restore a healthier skin, hair and nails. · Slow down aging process. Mix one sachet with 150ml of cold water and consume it before bedtime. Genetic influences, unhealthy diet, sedentary lifestyle and increasing of age lead to increased of excessive fat in the body. Long period of excessive fat deposited in the body caused stubborn fat developed. Our amazing products Svelte (Mocha Flavor) and Figura (Peach Flavor) are formulated with 100% natural and organic ingredients yet it’s delicious. It burns off those stubborn fats and also shapes up your body. Besides that, it increases your lean muscle mass and also the metabolic rate. Consequently, energy produced will be increased significantly. Moreover, there’s no rebound effect in Svelte . Figura due to increased metabolic rate and lean muscle mass prevent rapid weight gain after stopping our products. FidellaTM Svelte. Figura provides you a healthy yet effective slimming solution. after breakfast. You are advised to consume after breakfast if you have gastrointestinal problems. Copyright © 2013. SHIN BEAUTY 美之家纤体美容坊. All rights reserved.